Previous PostThe Ruger SP101.Next PostUnder the Bus. Hey Mad Orge- I enjoy reading your post and for once you and I are on the same page. My SP101 was my first big hand gun. Have the same grips as yours. But for my small framed hands, I load 38+P. I find the 158 grn a little to snappy, unless Im out in the Hi Uintahs. Where the Bear and the Mt. Lion roam. How’s the family. .38+P is a great option. Family is doing beyond wonderful. Have you decided on a particular spare ammo carry/rapid reload system. Bianchi Speed Strips for the SP101. HIS Loaders for the MC. Are ya feeling the hate yet? Well, ok. “Hate” is such a strong word. How about we go with “deep green jealousy”? ::grinz:: I found a shorty 101 way back when and have always wanted another with a longer bbl. And a 100. And a Security Six. And a…er, well never mind. Haven’t been able to put the money with availability. Received a rash of crap about putting the Monogrip on a 2.25″ carry gun but they fit my hands better then the stock grips and really makes no difference in concealability. I’m a big proponent of Ruger products and own more than a few. Always good to see them getting the love they deserve. The 3″ is just such a sweet shooter for it’s size. Not really all that much longer of a barrel, but the results are a dramatic difference in the pointability and degree in which you can get that accuracy out of the 101. The 3″ 101 is truly a Shooter’s gun. I still want to get a 2.25″, and get some nice wood Boot Grips for it. As a fighting handgun the .357 in regards to flash, blast, recoil, capacity, weight, size and admit it, over kill, has been surpassed by the tech. 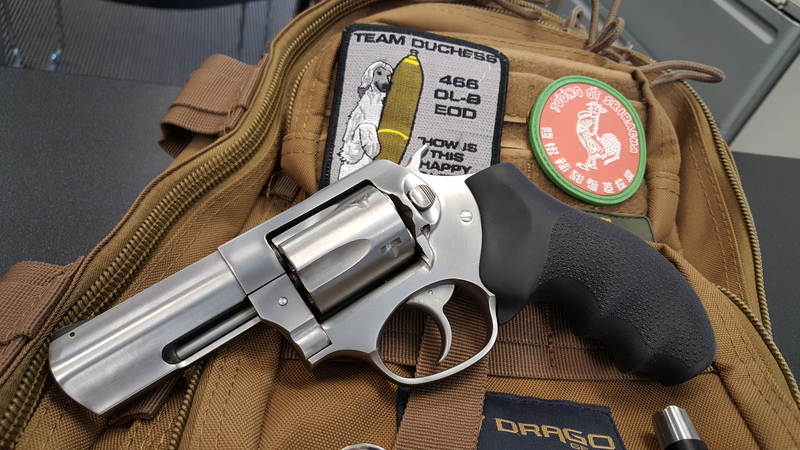 Will the .357 still get the job done? Yes. But it is not the best choice in today’s urban environment, especially at night. Camping in bear and cougar country fine. That said I have an SP101 I am very fond of but carry my Kahr P9 while the SP snoozes in the safe. Surpassed by tech? Not really.